best VPN tunnel that is free and unlimited to unblock sites. VPN Proxy Master is designed for Android provides you do everything you want online without wasting your data plan. It’s a fast, safe app that requires no username, password, and registration bandwidth limitation. It is best VPN tunnel that is free and unlimited to unblock sites. VPN Master automatically activates when you start it. So, hiding your privacy from the first instant and it’ll continue working in the background. However, if you wish to do so you can temporarily deactivate it by pressing Ctrl+ Q. Or clicking on the ‘stop’ button on the hidden icons bar at the lower part of the screen. By lowering the traffic to the minimum, broad band increases due to the data compression; the navigation speed will not be reduce. 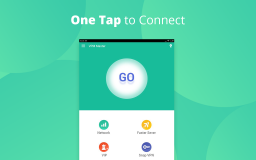 Drives a high speed and encrypted VPN connection to your smartphone or tablet same as Psiphon pro. What's new in this version of VPN Proxy Master? Improve privacy protection and using experience.